Making a great debut in the American marketplace for luxury sedans, the new Volvo S60 boasts high-tech amenities in a well-appointed cockpit. When you browse the showroom of Gengras Volvo, you can ask about the optional and standard electronic features that are installed in this Swedish-designed car. Measuring exactly 9.0 inches diagonally, the SENSUS touch screen is optional in the new Volvo S60. You can access GPS navigation and a handful of other advanced services in the next-generation multimedia system that's compatible with the best mobile platforms in the world. If you are looking for a luxury wagon, the Volvo V90 is an exceptional model. 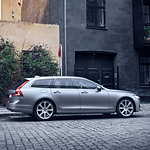 The Volvo V90 is a popular luxury wagon at Gengras Volvo in East Hartford because it comes with a number of features, which include performance features that provide you with an efficient and smooth ride.